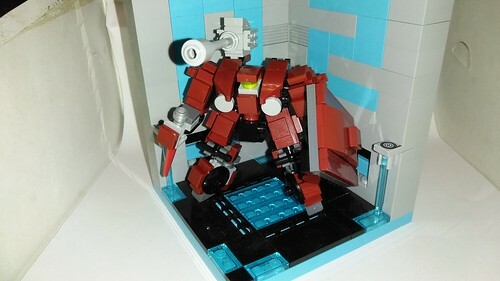 That claw arm is boss, and so is the Megaman-style cannon! Has seen some mediocre success, mostly with it's cheap construction and easy accessible parts. However, the Kibosh has also shown a potential weakness in it's construction that it lacks in defensive armor needed for its operators. 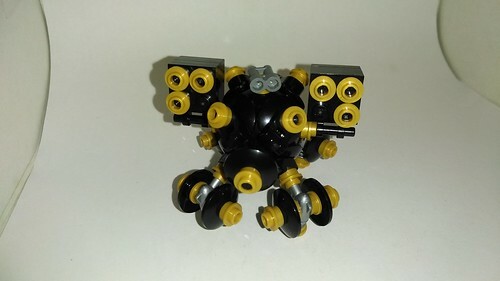 Kiboshis have use their small stature and wide range of motion to their advantages, however, there are many who deem it necessary to 'beef-up' the Kibosh's lacking armor. Two Mark 2 prototypes have been constructed to address this issue. Though these MK2's use slightly more costly parts and require a slightly more amount of time to produce, critics have seen possible potential in these more armored versions and expect to see operator survival rates increase. Hope you enjoyed and as always I eagerly await any and all comments you may wish to share. 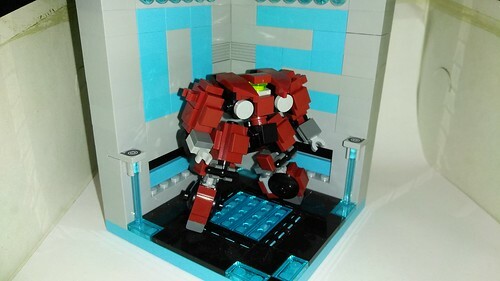 Gotta love a good chunky humanoid, nice work! Hope you enjoyed and I am always awaiting any and all comments you may wish to share. Gotta love the "skirts" on the red one! 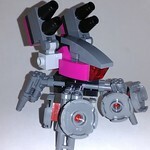 I like Robosha. Question though, you not give a lot of fluff or explaining like you normal do. Why is that? SamSam wrote: I like Robosha. Question though, you not give a lot of fluff or explaining like you normal do. Why is that? Sorry about that, I was actually quite upset at the time I posted it and I was not in the right set of mind to post anything positive, but I've had a day or two to relax and I'm better now. Bynoks, I wanted to try using them again. It took a bit of tinkering, but I think I managed to get an interesting look out of it. Anyway, I apologize for not posting this with the pictures. I hope you enjoyed and as always, I eagerly await any and all comments you wish to share. 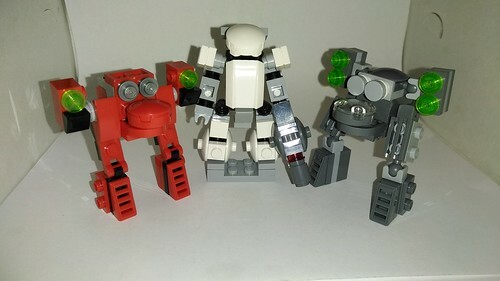 I particularly like the grey one with the Mixel Joints, however, it is slightly different than the original Jenner in that the Arm weapon pods are not connected to the 'Hips' of the mech. The red one was an attempt to correct the design flaw with using a Technic 1x1 Brick and sandwiching it between 2 Headlight bricks. Both use more commonly found parts and not a single T-Piece, Travis, Tap or Padlock piece. Like u said, gray noy exact but I like it too. Also seem eaiset to build. Can you still show breakdown of gray one? H.S. Jenner: Dual LRM's, Extensive Extra Armor Plating. SamSam wrote: Like u said, gray noy exact but I like it too. Also seem eaiset to build. Can you still show breakdown of gray one? 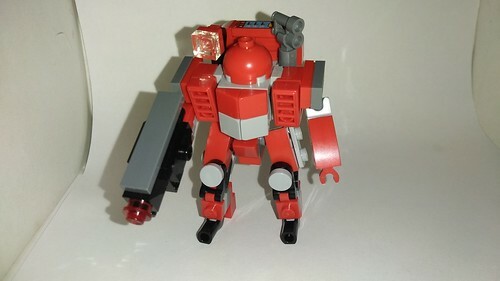 Per your request SamSam, here's an LDD file for anyone interested. It includes the first 2 I posted as well as the most recent Heavy Support Variant. 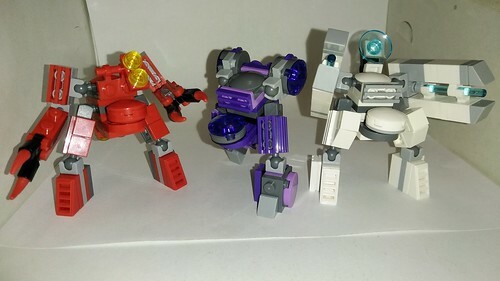 I particularly like the grey one with the Mixel Joints, however, it is slightly different than the original Jenner in that the Arm weapon pods are not connected to the 'Hips' of the mech. The Alex Iglesias redesign for MWO is like that (since all mechs must be able to torso twist) and it's my favorite version of the mech! 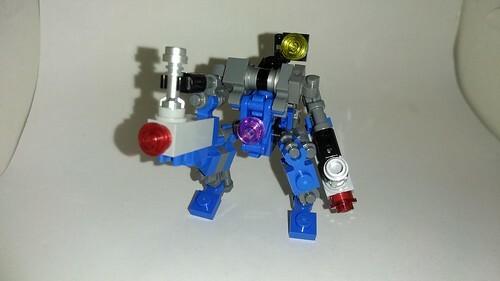 VitorFaria wrote: The Alex Iglesias redesign for MWO is like that (since all mechs must be able to torso twist) and it's my favorite version of the mech! 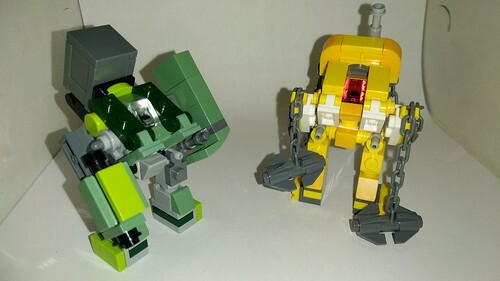 I noticed that too, but even the MWO version has a lower torso, which these builds lack. I'll have to work that in somehow. 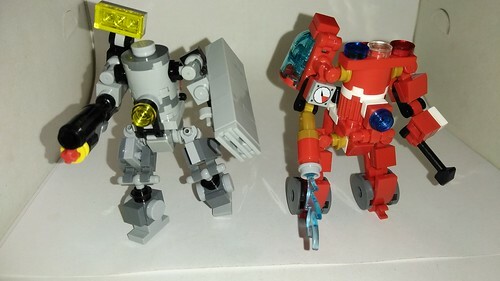 Here are 3 more Mixel Joint Jenners. 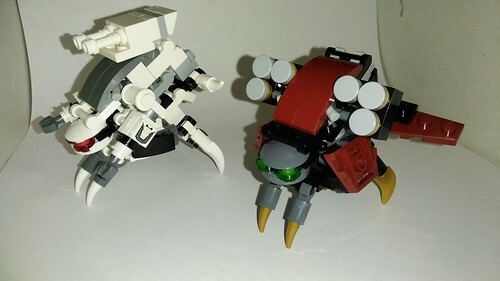 Because this design is simple and cheap, the only issue I'm currently having with them is getting the right colored parts. 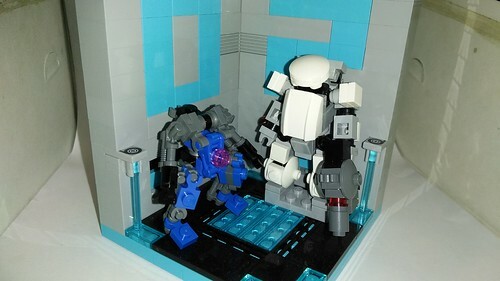 I did recently put in a bricklink order so hopefully I will have a complete coherent Jenner Company. I'll post it once they're ready. WHITE: Dual ER PPC's, Extra Armor Plates, Radar Dish. Hope you all enjoy, and as always, I eagerly await any and all comments you wish to share. Oops. Wrong opening. Let me try that again. M.P.T. Dual Swarmer Missile Pods, Multi Plated Armor, Targeting Scope. 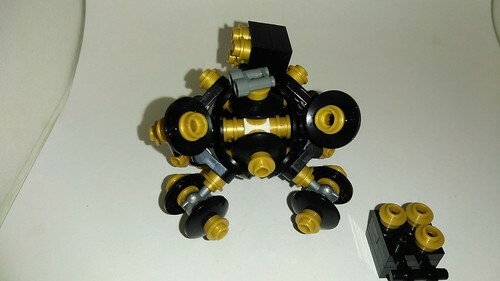 This one does not suffer from the floating dish parts the previous brain bots had and I am quite proud of it, though I wish black was a lot easier to take pics with. 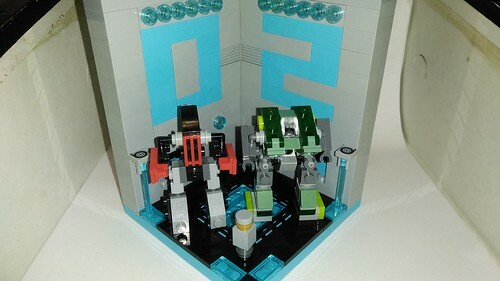 It even has an added feature that some of the plates can open up to see the inside without taking apart the build. Nothing too fancy, but still nice. Anyway, I hope you enjoyed and as always I eagerly await any and all comments you wish to share. I had posted one of these in another thread, but it was more of a prop than a proper introduction to the frame. Here, I hope to amend that. The StahlKorper (German for Steel Body), though somewhat strange in appearance, is an actual well versatile frame. 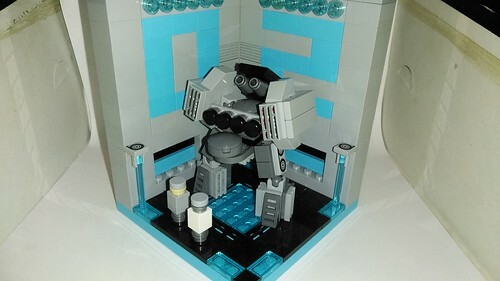 It was originally designed for light labor workings, however, it's limbs were too weak for the Labor Force's standards. The plans for the StahlKorper were about to become scrapped when an old veteran noticed that though the frame did not seem functional for labor work, it could fit in well as a light scout and skirmisher unit. 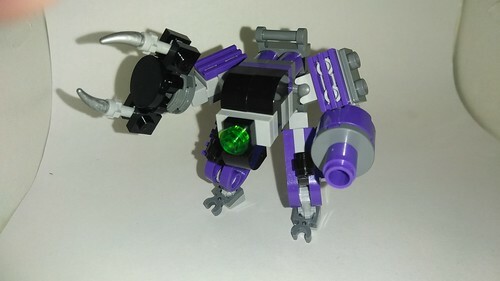 The old vet approached the designers and using his connections with the local Solar Union branch, the Stahlkorper was slightly redesigned for combat use. During testing, it was also conceived that the StahlKorper's light design could make it ideal for Public Safety Fast Response units. Though the frame had limitations, it's potential seemed to outweigh its flaws. Sorry SamSam, but I do not have the right parts in blue or white at the moment. But I will try to come up with something for you soon. 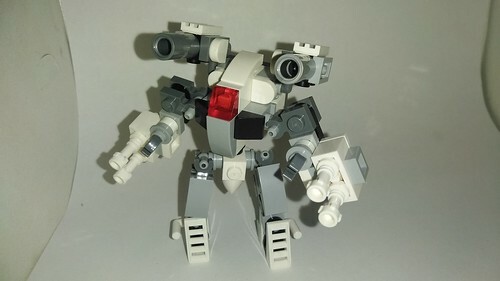 The STI-04 Impala is a standard humanoid frame that seems to have much potential in combat roles. So named the Impala because someone had commented how much the torso and upper body have a hood like shaping to it, (complete with headlights when looking at the circular chest access ports). Though the name was meant as a joke, it stuck, but the frame is anything but humorous as its multiple hardpoints can easily modify it for combat in a variety of roles.